First and foremost, we highly recommend checking a local Hawaii Calendar of Events prior to scheduling your trip, thus allowing you to determine what is and what is not occurring on the island of your choice ahead of time. We've detailed a few of the major events (specifically on the Big Island) below. Also, as a general rule of thumb, if you hope to avoid the crowds, then consider planning your trip to avoid holidays. Many folks from the West Coast of the mainland (or even from neighboring Oahu) will jump over to the less-visited islands for the holiday(s). This is especially true during the Christmas holidays when things get very busy in the islands. For more information, be sure to read this article's updated companion entry - Best Time to Visit Hawaii. As you might expect, when more visitors are traveling and staying on the islands - both accommodation and flight costs will increase in tandem with the crowds. The most notable impact this will have for most visitors, other than noticing the more 'crowded' feeling, is the financial costs that come with visiting during peak visitation periods (i.e. ; holidays and summer months). Hotel and other accommodation rates, will alternatively tend to fall - sometimes dramatically - during periods of low visitation. 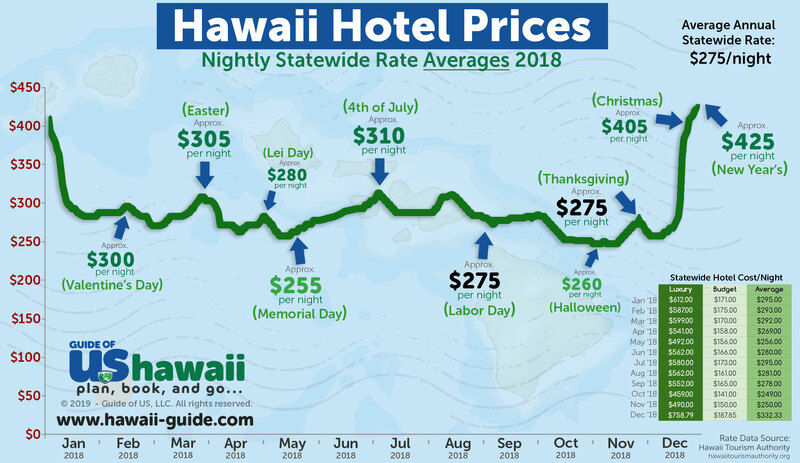 When planning your trip, the following graphic should provide a general overview of the statewide average prices for hotels during various times of the year. The data below was aggregated and visually repurposed from 2017-2018 Infrastructure & Performance Reports by the HawaiiTourismAuthority. 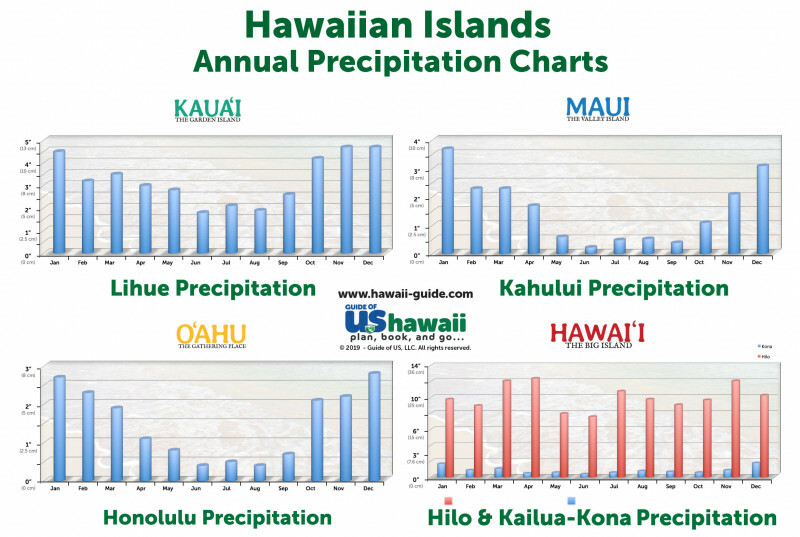 First, we want to point out that there is considerable confusion about there being a "wet/dry" season and a "high/low" travel season in Hawaii. The two assumptions are in some ways true and in some ways false. 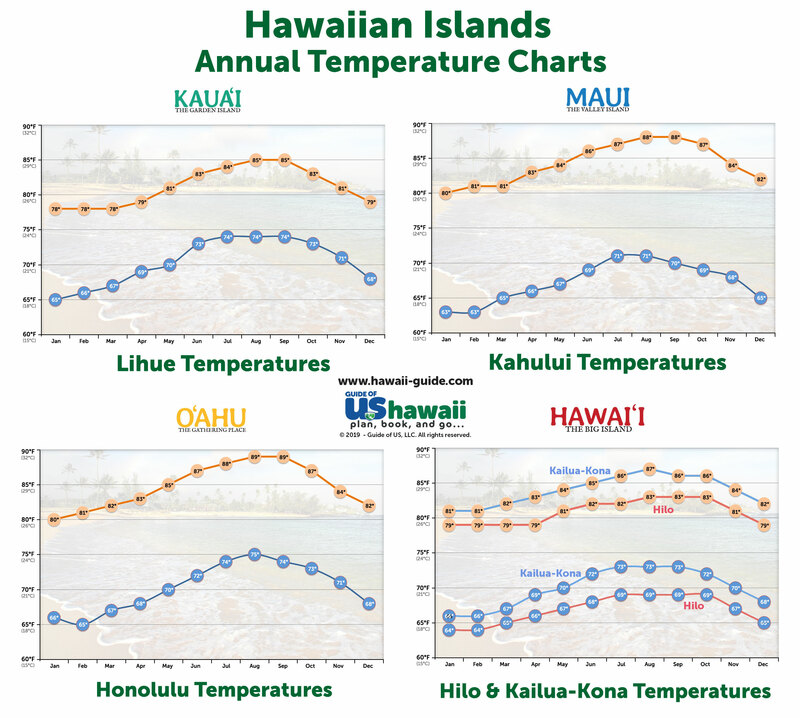 Let's take a closer look at each of the seasons in Hawaii. Less rain starts to fall on the islands as the trade winds die down to their summer levels, making this an ideal time to visit. Some call this the start of the "dry" season. The weather is almost always perfect, and, in general, this is the best time to find good bargain travel activities. After mid-April (typically after Easter), most airfare and lodging prices drop as a result of the "high-demand" period ending. The last week of April and the first week of May are often a time when most Japanese visitors will arrive due to the "Golden Week" holiday in Japan. Water temperatures measure near the high 70°F (21° C) mark this time of year, and the surf begins to die down as the trade winds let up. The best part of the spring is the fresh flowers, fruit, and vegetation that can be seen around the island. This is our favorite time to visit. We should note that the spring does hold one large event on the Big Island of Hawaii that can cause crowding on the Hilo side of the Island: the Merrie Monarch festival, which is held annually starting on Easter Sunday. Typically, the summer months, as a whole, result in less visitor demand. This fact will benefit visitors in the form of lower rates for both accommodations and rental vehicles. Some will label this the "low season," however, this "low season" classification can often be misleading regarding pricing your trip and of what crowd sizes to expect. Since June through August are very popular with travelers in general, not just to Hawaii, Airline prices will often increase into late May through July, as demand is higher for seats nationwide. Thus, if you are flying from the East Coast or the Midwest, the most expensive flight you pay for might ironically be the continental flight to the West Coast. According to the tourism authority in the islands, July continues to be the month with the most visitor arrivals. To us, this makes sense because this is when most families visit the island, as their children are out of school. The same is true for local children on the island; this is their summer, and they often frequent the same beaches, trails, and places you'll be visiting, too. The summer months are always the warmest on the island, and temperatures can reach as high as 90+°F (32+°C) under the right conditions. Combined with the high humidity, the heat can occasionally be unpleasant for some travelers not accustomed to it. Surf is at its lowest during the summer, and the rain clouds are few and far between, except on the windward coast. Note the difference in flow rates at Rainbow Falls (above), located on the Big Island, between summer (left) and winter (right). Water temperatures usually rise above the 80°F (26°C) mark during the Summer months. The tradewinds are also calmer during this time of the year as well, resulting in less surf on the northern shores (e.g., better for snorkeling, swimming, etc.) on each island. Regarding hiking, in our opinion, the summer months are typically too warm for a lot of outdoor hiking and adventure, especially at locations like the Big Island's black lava fields or any other island's coastal trails (Kalalau on Kauai for example). Lower prices are helpful on the wallet; however, the sun and humidity combination makes going anywhere, but the beach seems like a chore. If you plan to be especially active outdoors, we advise visiting a few months earlier in the spring or a few months later in the fall if you can. While historically a rare event, the summer months are also hurricane season in Hawaii, and the islands are certainly not immune to a hit. Such was the case with Iniki in September 1992. It came ashore on Kauai as a strong category 3 (borderline category 4) storm. Since then, several additional storms have grazed Hawaii, but none have caused such widespread damage as Iniki. Again, tropical storm systems are historically rare - simply be aware they do occur from time to time. In fact, over the last few years including the Summer of 2018, there have been more tropical systems near and around the islands than normal. More rain begins to fall in November as the trade winds increase to their winter levels, and there are days where rain showers will dominate on the windward coast and mauka areas. Occasionally, Kona storms will dump a tremendous amount of rain on the islands and can cause wind damage in several areas. Tropical Storms and/or Hurricanes can also still pose a threat to Hawaii during the fall. However, as a general rule, Kona storms cause more headaches than tropical storms. So what exactly IS a Kona storm? When a Kona storm develops or moves into the area, the prevailing wind pattern changes - south and southwesterly winds replace the trade winds. Since the winds typically affect the Kona coast of the Big Island, the storms have thus taken on that name. Although destructive Kona storms are fairly rare, they occur often enough to warrant a mention here. Kona storms bring high winds, heavy rain, snow atop higher mountains (like Mauna Kea and Mauna Loa on the Big Island), and lightning and thunder can occur (a rarity in Hawaii). Due to extreme terrain differences in the islands, weather conditions can be highly variable across a relatively small area. Gusts of wind up to 60 mph (96km/h) have been known to happen on the Big Island, while other portions of the Hawaiian chain simply deal with increasing breezes. In general, the fall months and the spring months are very similar. Like in the spring, the Big Island of Hawaii can become quite busy during October, as a major event is held on the island. Typically, in October, the Ironman Triathlon event is held on the Kona side of the Big Island of Hawaii. Check online calendars for the exact dates each year. 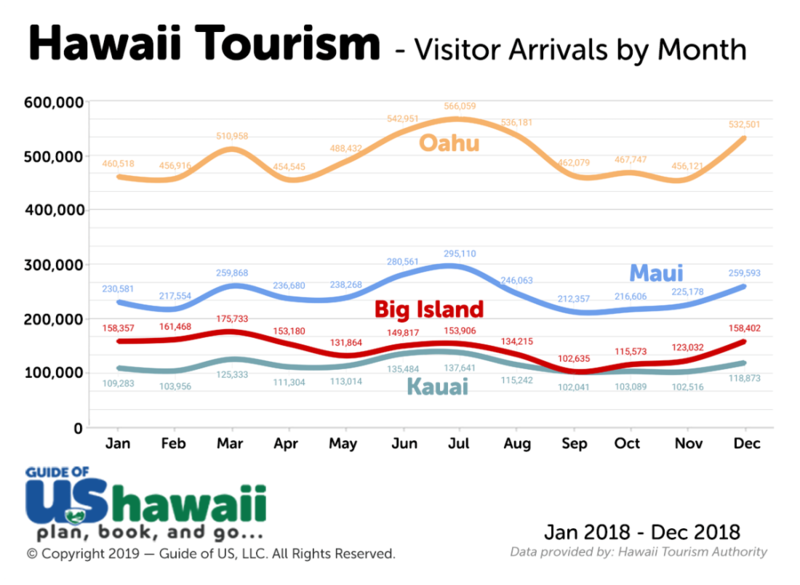 Also note that in the late fall, visitor demand to Hawaii begins to increase in mid-December, which typically causes rates for flights, tours, and accommodations to rise. By the first day of winter, the high demand period in Hawaii around Christmas and New Year's has begun on the islands. The 'high season/period' term, of course, brings back the debate about defining "low" and "high" season. And although the tourism authority in the islands, using 2018 data, shows the second highest number of visitors arriving in December of each year, it's important to note that most of these visitors are showing up for about a week - Christmas through New Year. This period is always a busy time on the islands and can almost single-handedly make this the "high season" for accommodations. Thus, on average, the prices are higher and occupancy rates are higher. Bottom-line on pricing: expect to pay more in winter months. As noted in the introduction, Christmas is a time that anyone who dislikes crowds should avoid coming to the islands. The high temperature remains a comfortable average of near 78°F (25°C). Water temperatures are often around 74°F (23°C) during this period, and swimming can be rough as a result of the higher surf. If you're coming to Hawaii to see any surfing events, then this is definitely the time to come -, especially on Maui and Oahu. During the winter months, this is one of the only places in the world you can come play in the snow (on the Big Island and occasionally Maui) and swim in the (warm) ocean in the same day. Winter is also the whale watching season in Hawaii. Humpback whales travel all the way from Alaska every winter to mate, calve, and birth their young (usually in the shallow waters off the coast of Maui). Unless you are coming specifically for big surf or to see whales, we believe winter is usually the least desirable time to visit the islands. Despite the waterfalls being more active due to the rain, and the potential to see huge surf and the amazing shows put on by whales breaching off the coast, the combination of higher prices, wetter weather, and cooler temperatures has never sat well with us. You can easily visit during the spring or fall for much cheaper prices and better weather. Before we end this section we want to stress again that the "low" or "high" demand season/period terminology can and does vary on a year-to-year basis; therefore, predicting the visitation rates season to season becomes more and more difficult. Several factors, including the economy and weather, can affect travel to and from Hawaii. The same is true of natural events (like flooding, earthquakes, etc.). This is a dated reference, but for example, during the span of one week in August 2007, the Big Island was faced with a 5.4 earthquake, a Category 3 Hurricane, and a tsunami warning after an earthquake off the coast of Peru. As they say in the islands, "There's never a dull moment here." Regardless of when you travel, to always find the best rates - we recommend that you search for and book your flight with our Hawaii Flights search tool. We include the best rates for flights with all major carriers, including Hawaiian Airlines. Hawaiian is not only are they the largest airline serving the Hawaiian Islands, but they also appear near the top of many "best carrier" lists; including the most on-time carrier, fewest cancellations, lowest baggage handling issues, and safest airline. Start Booking Your Hawaii Vacation! It's easy to plan and book your perfect Hawaii trip. Enter your trip dates to search Hawaii hotels, resorts, and other Hawaii accommodations. 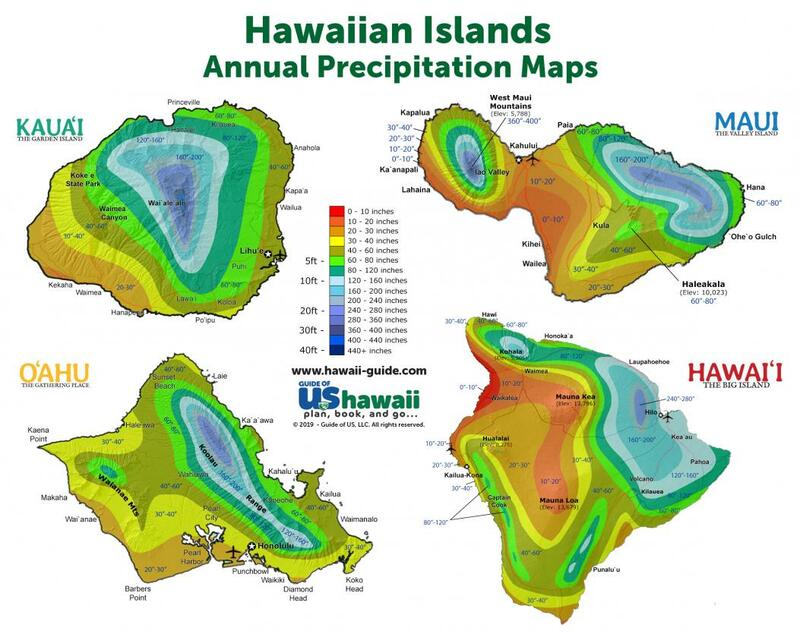 If you need even more detailed information about Hawaii precipitation and climate patterns, please visit our Hawaii Weather page. Still not sure where to visit? Check out our Which Hawaii Island to Visit page and take a quick quiz to get your results. Once you've chosen an island, browse Hawaii timeshare resales for sale by owner for amazing lodging deals throughout Hawaii. As noted, selecting the right time of year to visit Hawaii is no easy task for many visitors. It can be a confusing and even frustrating job, and that's probably the last thing anyone wants when planning a trip to Hawaii. That’s why we’ve created this handy quiz- to help determine which time(s) of the year are best for you. Based on your unique responses, we'll provide the top four months we believe are best for you and your travel party. Simply read and answer the questions below- each of your answers will earn a set number of points which will be tallied at the end. Make sure to answer as many of the questions as possible to ensure the most accurate results.